1. Can you explain to our readers what`s your project about and how it works? Our project contemplates several solutions to a problem that we can observe at present: "the projects related to the blockchain, in their majority, are directed to people who have computer knowledge", excluding a great number of people that, either for lack of knowledge or lack of access to technology, have not been able to take effective advantage of all the advances that the blockchain offers to it's users. In view of this problem we developed a coin called KOI to be used in an ecosystem built through our projects, and thus achieve a real massification of the Blockchain. By using Ethereum technology, which provides transparency and security in transactions, we want to offer a technological platform, but easy to use at the same time, that generates trust among it's users and speed in operations, allowing the economic growth of all the factors involved. Being a common user or commercial establishments. The Koi Currency will be used through a P2P application with web interface and on mobile devices, allowing interaction between it's users simply with their ID and provisional key generated by them. These operations can be verified through a wallet consultation. The versatility of these operations will achieve from commercial exchanges to receipt of remittances. Each one of the projects generated in Koitech Studios are thought for the interaction to the ecosystem of different sectors inside and outside the Blockchain community. 2. What is the main idea behind the project? In an economy with hyperinflation, having access to technology is very difficult, having mobile devices by most people eliminates the possibility of P2P exchanges or use of the Blockchain. In developed countries or with a good economic stability, where the limitations are not technological if not because of ignorance, there is information regarding the Blockchain although few are those who implement their technology, this is because, within the daily activities, there is no adequate use or ease to use. The main idea of the project focuses on the construction of a complete ecosystem, where our currency would circulate, involving different economic and social sectors, where the use of the Blockchain could be found in everyday activities, such as: pay in your favorite restaurant or the taxi back to your home, no need for technological devices at hand. 3. Where are you physically located? Ours offices are located in Venezuela and Chile. 4. Are you focused in any specific geographic areas? Our Project takes as a starting point a localized need, where the commercial exchange is affected due to the constant failures in the telecommunication networks and the difficult access to the technological devices or points of sale that could be found in other countries, avoiding a growth economic of the shops. The use of our currency based on the blockchain allows transparency in operations and has no geographical limits. However, the start of Our activities will be focused on the Venezuelan Region, then expanding worldwide. 5. What purpose does the blockchain have in your project and what role does the coin have? The App that we developed at the beginning of our economic activity, interacted with the national bank (Venezuelan) and with verifications of manual transactions; The limitations imposed by the banking institutions led us to implement the use of the Blockchain technology, automating all manual processes and allowing audits in each one of them. 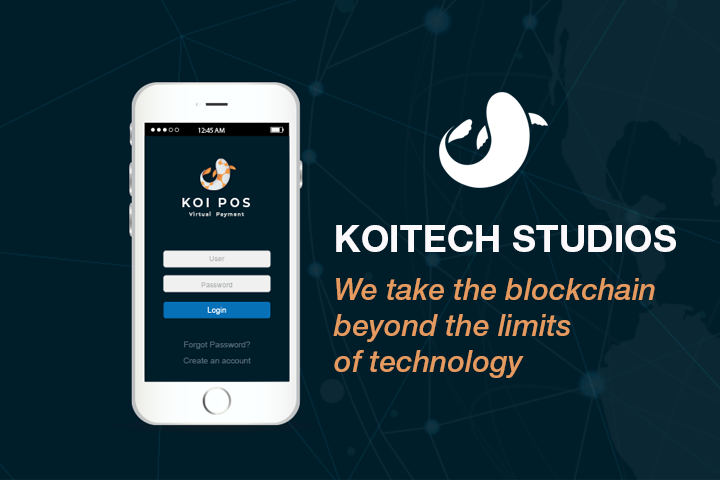 The use of Blockchain technology in our project will allow an exchange of our KOI currency, based on the ERC20 standard, in a fast, transparent and secure way. 6. Is the project open source, if yes Where can I find the source code? 8. Are there any earlier backers of your project? The development of the P2P platform was completed with it's own capital. In the ICO stage, the funds will be used to boost and expand the use of our currency; for now we have not had the need to look for commercial allies, although we do not close ourselves to the future idea of doing so either. 9. Why should we invest in Koitech Studio? In comparison to other initiatives that reach the ICO stage with their hands empty and waiting for economic resources to start the development of their projects, Koitech Studio has already overcome that initial phase. What drives us is not only limited to satisfying a particular need, but also a collective good, by achieving the use of the Blockchain in any everyday environment. Each of our projects will increase the demand for the use of KOI and having a controlled and planned offer will allow the growth and economic revaluation of our currency, as well as the transactions carried out within our ecosystem will generate a financial profit to the company that will allow it continue to promote new developments. Once the massification and establishment of KOI has been achieved, not only would the positive transformation of the economy and development of a country be achieved, but it would have an impact on a global level. 10. Do you want to message something to our readers? If you wish to contribute to the true massification of the Blockchain, we invite you to be part of this initiative. To find out more about KOI, we invite you to follow us on social networks like @koitechstudios.